The British cabinet has reached agreement on the outline of its future relationship with the EU following marathon talks at Chequers. The deal foresees a so-called UK-EU free trade area, which would establish a common rulebook for industrial goods and agriculture, but keep Britain separate for services. The agreement says there would be no need for an Irish backstop, but that the UK would still agree to a legally operable backstop in the Withdrawal Agreement. The UK would pursue its own course for services, which, the document states, would permit Britain to strike free trade deals around the world. In a statement, Downing Street said the deal would meet the UK's commitment to avoid a hard border in Ireland, and protect the Good Friday Agreement. The three-page document sets out the parameters of a longer white paper on the future relationship, which will be published next week. It states that it would "preserve the constitutional and economic integrity of the UK" and would honour the letter and spirit of the Good Friday Agreement. London, it said, would "nonetheless" agree on the "backstop" solution as part of the Withdrawal Agreement. However, the text adds, it "would not need to be brought into effect". It suggests that the UK would stay in line with EU standards in the production of goods and food products by signing up to a treaty with the EU, with the promise of continued harmonisation with EU rules on standards. That continued application of EU standards would be enshrined in UK law. The agreement says that that commitment would only apply to those rules which are required to avoid friction at borders. According to the document, the British parliament would have to approve any changes in EU rules, although it accepts that if parliament decided to oppose any changes there would be "consequences". The agreement does not spell out what those consequences are. Details of the draft document being discussed in Chequers were released last night, prompting speculation that hardline Brexiteer ministers would resign, as the draft seemed to row back on Theresa May's red lines. Tonight's document appears to have watered down some of the earlier language. Instead of the UK abiding by the oversight of the European Court of Justice in cases where there are breaches of EU standards for goods, the document suggests a "joint institutional framework," including a joint committee. This would arbitrate if there were any disputes over agreements reached between the EU and UK, the paper says. The paper suggests that UK courts would interpret the rules if cases were in breach of the rules through the joint institutional framework, "while in the EU" this would be done by "EU courts". While the process would take account of EU case law, no one court would be allowed to resolve disputes between both sides. The document says the UK and EU would continue to have "frictionless access to each other's markets for goods, including agricultural, food and fisheries products, protecting the uniquely integrated supply chains and just-in-time processes that have developed across the UK and the EU over the last 40 years, and the jobs and livelihoods dependent on them". However, it stated that the UK would leave the Common Agriculture Policy and Common Fisheries Policy, "taking back control of UK waters as an independent coastal state and designing a domestic agricultural policy that works in the best interests of the UK". The paper also said that the UK should continue preparations for a "range of potential outcomes, including the possibility of 'no deal.'" 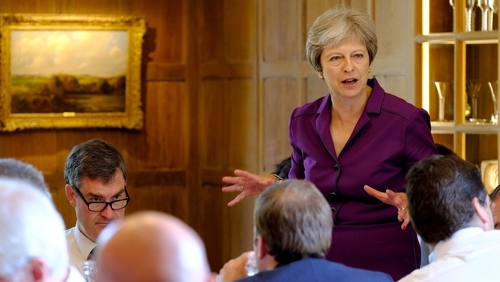 British Prime Minister Theresa May said the cabinet had agreed a "collective position" on the future of the negotiations with the EU. "As a result, we avoid friction in terms of trade, which protects jobs and livelihoods, as well as meeting our commitments in Northern Ireland. "We have also agreed a new business-friendly customs model with freedom to strike new trade deals around the world." Mrs May said: "Next week we will be publishing a White Paper which will set out more details of how we will be taking back control of our money, laws and borders. "Now we must all move at pace to negotiate our proposal with the EU to deliver the prosperous and secure future all our people deserve." Ahead of the formal announcement of the deal, Tory Brexiteers warned that Mrs May's position could be under threat if she watered down her red lines. Leading Brexiteer David Jones, a former minister at Mr Davis's Department for Exiting the EU, said the proposed deal breached all three of Mrs May's red lines of leaving the single market, customs union and jurisdiction of the ECJ. Describing the plan as "not very good at all", Mr Jones said it would deliver "something less than the full Brexit we have had repeated promises of by the PM and Cabinet members". Andrea Jenkyns, who quit as a ministerial aide in order to speak more freely about Brexit, said she would be willing to help trigger a leadership contest if the deal left the UK "one foot in, one foot out" of the EU. "I am not a hypocrite," the Morley and Outwood MP said in an interview recorded for the BBC's Sunday Politics in Yorkshire and Lincolnshire. And Stewart Jackson, a former MP now the senior aide to the Brexit Secretary, tweeted a link to a story about a poll warning that "Tories will lose votes if they cross Brexit red lines". Central to this plan is the establishment of a "free trade area for goods" to "avoid friction at the border, protect jobs and livelihoods, and ensure both sides meet their commitments to Northern Ireland and Ireland". - The UK and EU agreeing a "common rulebook for all goods including agri-foods", with British ministers committing in a treaty to ongoing harmonisation with Brussels' rules necessary to provide for frictionless trade at ports and the border with Ireland. - The UK Parliament would have the ability to choose not to incorporate future rules, but accepts there would be "consequences" for trade. - There would be "regulatory flexibility" for services, with the UK recognising that would mean neither side enjoying "current levels of access" to each other's markets. - A common rulebook on state aid would be agreed, preventing either side from subsidising their own industries, with co-operation between competition watchdogs on either side of the English Channel. - The UK will commit to maintaining high environmental, climate change, social, employment and consumer protection standards. - A joint institutional framework will be established to oversee UK-EU agreements, with the UK agreeing to pay "due regard" to EU case law in areas where the common rulebook applies. - A "facilitated customs agreement" would remove the need for customs checks by treating the UK and EU "as if a combined customs territory". - The UK would apply the EU's tariffs and trade policy for goods intended for the bloc but would be able to control its own tariffs and trade for the domestic market, with the plan being phased in as both sides complete the necessary preparations. Ministers claimed the plan would result in an "ambitious relationship that nonetheless respected the UK's sovereignty and the EU's autonomy". Speaking after a Fine Gael party function in Cork this afternoon, Taoiseach Leo Varadkar said he expects to receive the British government’s white paper next week and it will form the basis for negotiations on the final status between the UK and EU. He said he spoke to Mrs May last week and some indications from her are a significant step in the right direction. He also said the EU will be flexible if the UK changes some of its red line issues.